Congratulations to Dr. George Rouskas, Director of Graduate Programs and Professor in the NC State Computer Science Department, on being recognized as an Alumni Association Distinguished Graduate Professor for 2018. The Selection Committee was unanimous in its praise of Rouskas’ exceptional record of promoting and supporting multiple facets of graduate education at NC State. Particularly impressive were the letters from the students themselves, which attest to the extraordinary quality of mentoring that he provided both during and after their graduate programs at NC State. Rouskas, who joined the department in 1994, is the author of the monograph "Internet Tiered Services: Theory, Economics and Quality of Service" (Springer, 2009), co-editor of the book "Next-Generation Internet: Architectures and Protocols" (Cambridge University Press, 2011), and co-editor of the book "Traffic Grooming for Optical Networks: Foundations, Techniques and Frontiers" (Springer, 2008). He currently serves as Editor-in-Chief of IEEE Networking Letters and as a Steering Committee Member of the OFC conference. He co-founded and served as co-Editor-in Chief of the Elsevier journal Optical Switching and Networking from 2004-2017. In 2016-17 he served as Chair of the IEEE Communications Society Distinguished Lecturer Selection Committee, as Chair of the Optical Networking Technical Committee (ONTC), and as Vice-Chair of the IEEE Communications Society Technical and Educational Activities Council. As an IEEE Distinguished Lecturer in 2010-2011, he completed four tours in the US, Caribbean, and Sri Lanka. He was the TPC or General chair for: NETWORKS 2018, IEEE MASS 2018, IEEE ICC ONS 2017, IEEE ICNP 2014, ICCCN 2013 and 2011, IEEE GLOBECOM ONS 2010, BROADNETS 2007, IEEE LANMAN 2005 and 2004, and IFIP NETWORKING 2004. Rouskas was elected a Fellow of the IEEE in 2012 for his “contributions in algorithms, protocols, and architectures of optical networks.” His many other awards include an IEEE GLOBECOM Outstanding Service Award (2010), an IBM Faculty Partnership Award (2007), an ALCOA Foundation Engineering Research Achievement Award (2004, NC State College of Engineering), an Alumni Outstanding Research Award (2003, NC State), an NSF CAREER Award (1997), an Outstanding New Teacher Award (1995, NC State Department of Computer Science). And he was inducted in the NC State University Academy of Outstanding Teachers in 2004. As of 2018, 24 PhD students and 12 Masters thesis students have graduated under Rouskas’ supervision. His research interests are in the broad field of computer networking -- specifically, optical networks, Internet architectures and protocols, network design and optimization, performance modeling, and scheduling. 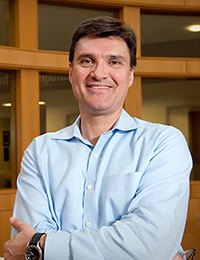 Rouskas earned his PhD and Master’s Degree in Computer Science from the Georgia Institute of Technology, and his BS in Computer Science from The National Technical University of Athens, Greece.